Well November has come to an end and I hope everyone had a lovely holiday! I will be blogging a bit more in the coming weeks because finals will be over after next week, thank goodness! Because of the craziness with school I haven’t been writing or reading much. I recently finished The Retribution of Mara Dyer which was the final book in the Mara Dyer series and it was AMAZING! The ending was so perfect, props to Michelle Hodkin on that one. I’m currently reading Waterfall by Lauren Kate which is the sequel to Teardrop. She is also well-known for her series Fallen, which is so good! I am very behind on my Goodreads goal which is 75 books this year which I’m only at 53. I hope to get closer once I’m done with finals. Any recommendations? I have a mile long list of TBR’s but I’m always looking to add more! Though I haven’t been reading as much I have been gaming quite a bit. 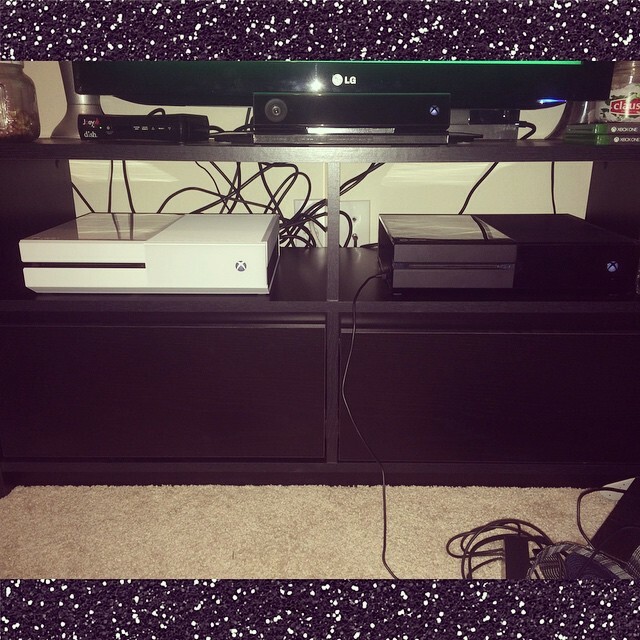 My wonderful future hubby bought me an Xbox One recently so we can game together. I got the Sunset Overdrive special edition Xbox One which of course came with Sunset Overdrive. This is our current set up, mine is on the left and his is on the right. So far I have Destiny, Sunset Overdrive, and Assassins Creed Unity. I really want to get the Master Chief Collection as I haven’t played Halo 2 since I was in high school! And there’s no beating some good old Matchmaking!!! Any other readers out there that love gaming too? Thank you for those of you who still read my blog even though I’m not super active as of late! I promise I will post more frequently in the coming weeks! Okie Dokie! So I’ve been in a bit of a reading funk… mainly due to going back to school. I’m doing relatively well in my classes so YAY! But since I’ve been so busy I haven’t touched either of my WIPs since before classes started. However even though I’m on the fence with the whole NaNoWriMo thing, I think I might sign up and try to do it in hopes for motivation. In the new Westerfeld book his main character Darcy essentially does NaNoWriMo and cranks out a book. I think it inspired me a little to try to do the same thing even though I doubt I can sit down every day and manage to write. November is one of the craziest times of year for me because of family gatherings so it will be interesting to see what happens. Anyone else doing NaNoWriMo? or thinking of it? Here is the link to NANOWRIMO if you’re interested in more info! Like I said I’m on the fence and still deciding if I will even sign up. On the fangirl side of things, it’s almost Halloween!!!! I’ve got my costume ready and already had a party I attended in it. My fiance and I decided to do a couples costume since we’ve never really found a couple we wanted to dress as until now! For those of you who don’t know what I look like this my before! 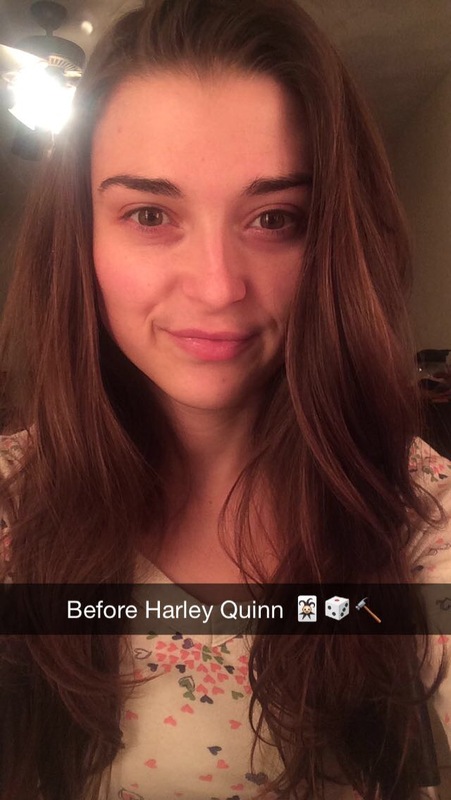 Here’s my after! I also am in the midst of making a giant mallet . I don’t have my hair colored obviously for my trial but I will have it lighter with the red and black tips. 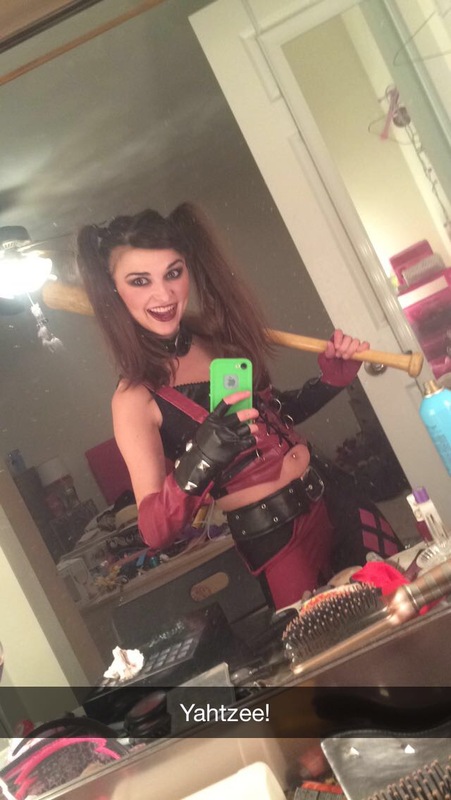 My fiance is obviously going to be dressed as my puddin’, the one and only Mistah J 😉 If you still don’t know who I’m talking about… GO WATCH BATMAN THE ANIMATED SERIES LIKE NOW and if you do, High-five to you sir or madame! 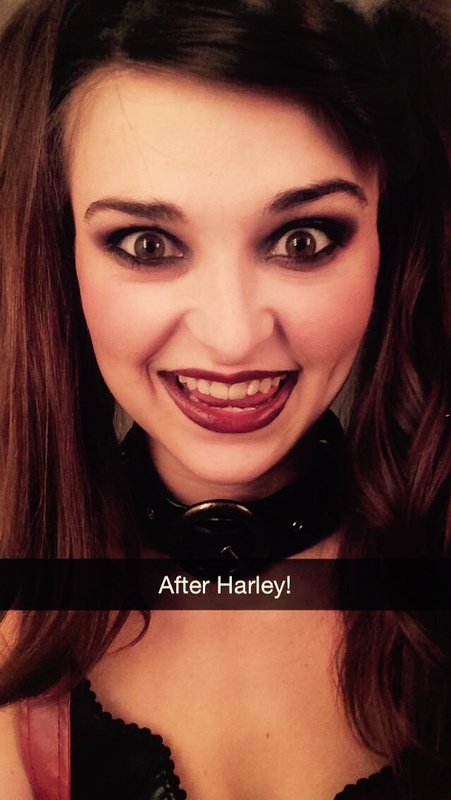 So far I’ve been told I pull of crazy really well… which I’m not sure is a good thing necessarily haha! Anyone else big into Halloween? 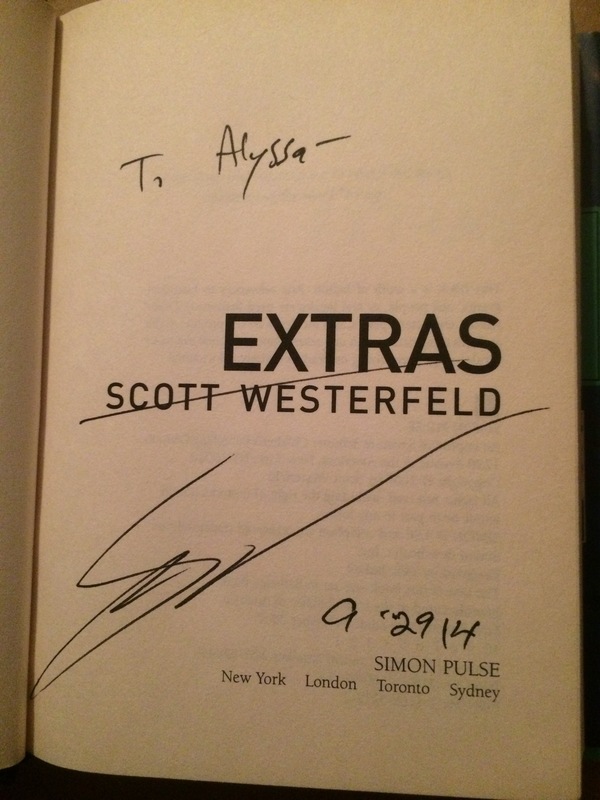 Scott talked for about an hour and it was awesome! He has such an awesome personality and really interacted with the audience! He showed his attack video at the beginning which was hilarious! If you haven’t seen it yet here is the LINK! Scott also brought his LOVELY wife, Author Justine Larbalestier! 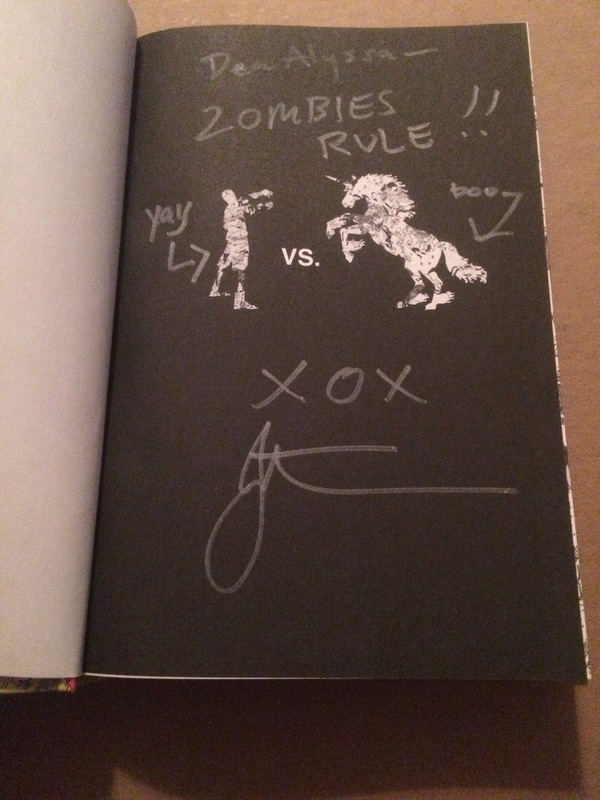 Which I was so glad I checked his facebook today and saw she was going to be with him since I have Zombies vs. Unicorns and it reminded me that Scott and Justine both were part of the book! Justine was hilarious and my fiance and I got to talk to her quite a bit and she told us a little about her upcoming book, which is quite BLOODY! 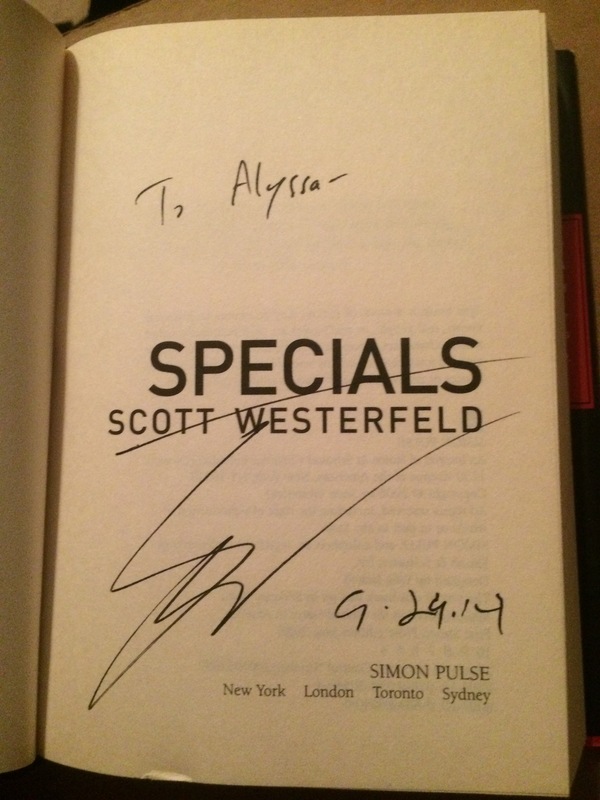 When he signed my books, which I had nine to get signed, he was so friendly and nice! I told him I had been a fan since I was 14 and he couldn’t believe I was 22! 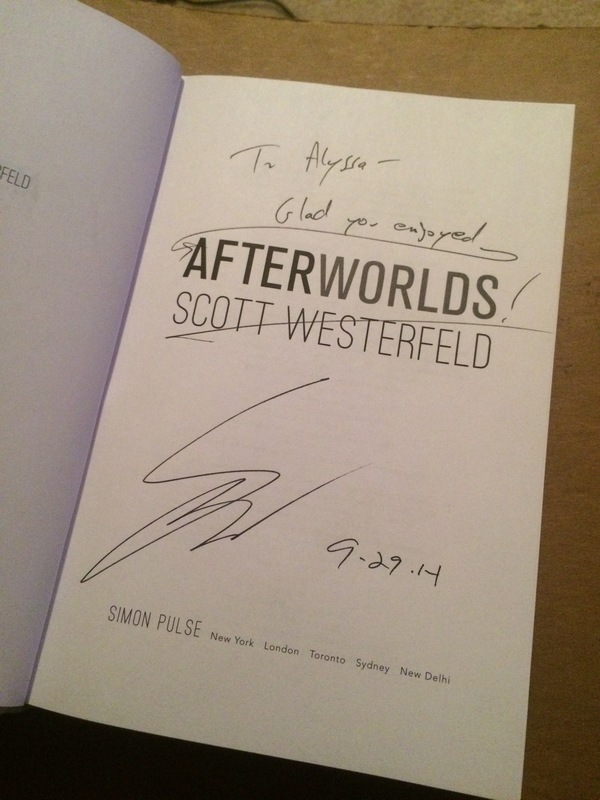 He asked which of his books was my favorite of course it was Uglies but Afterworlds is kind of taking it’s place! When I was leaving the signing table he shook my hand and said “Thanks for buying pretty much all my books” and gave me a huge smile! haha, I definitely had the most books out of everyone there! Here are my pictures! 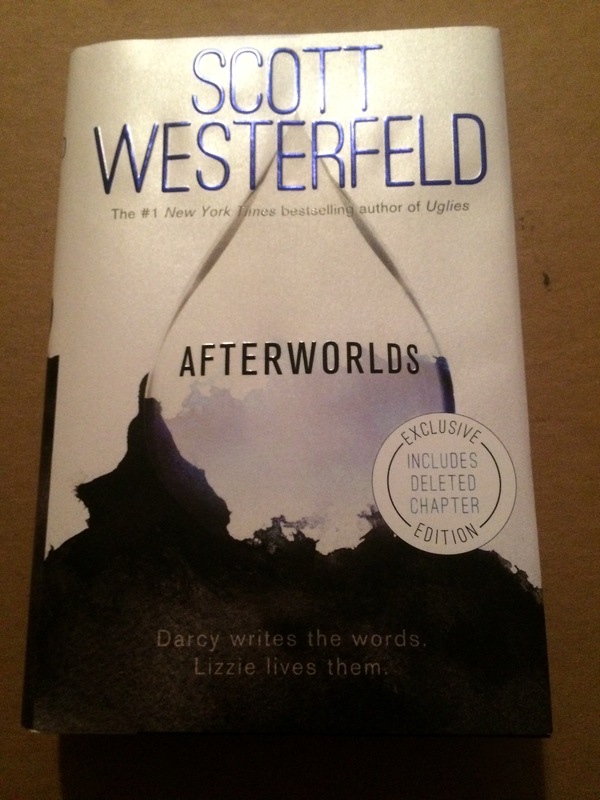 Afterworlds signed!!! Definitely recommend it! 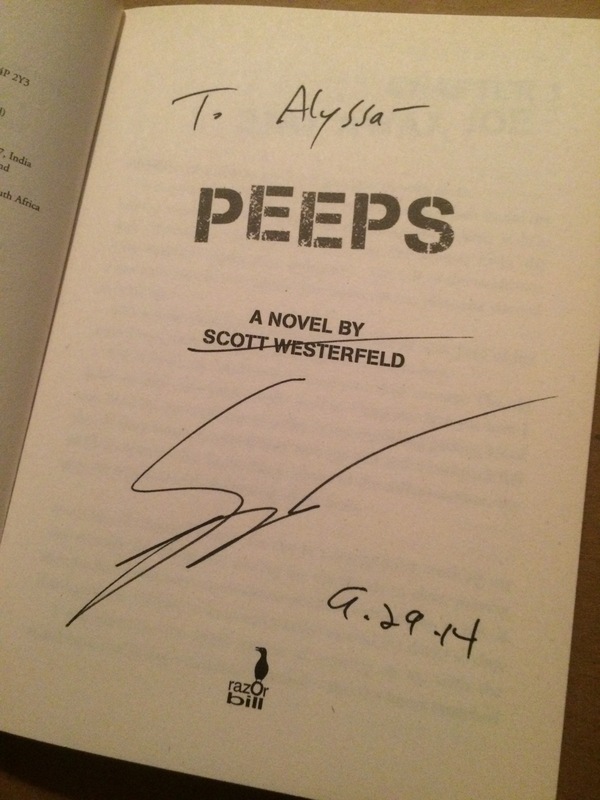 Peeps and The Last Days Signed! 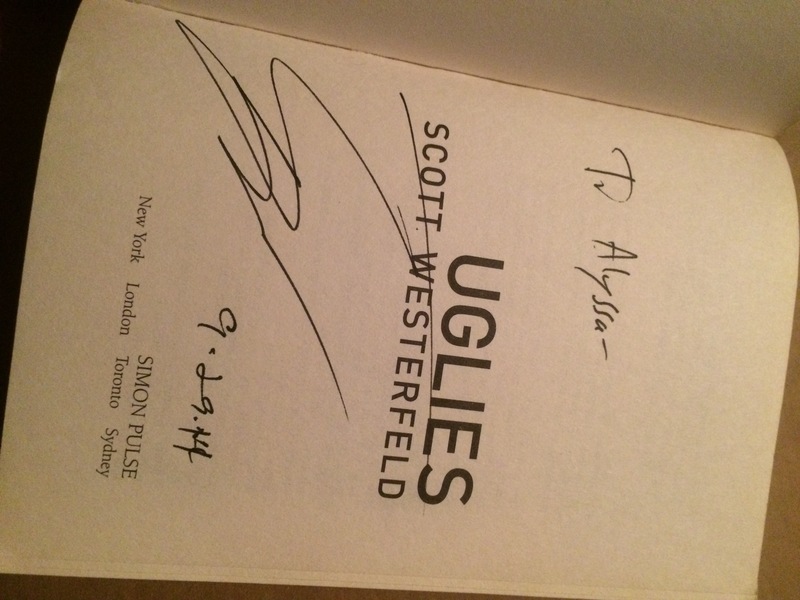 The ENTIRE Uglies Series signed! AHHHH! In case you couldn’t tell, I had a blast! 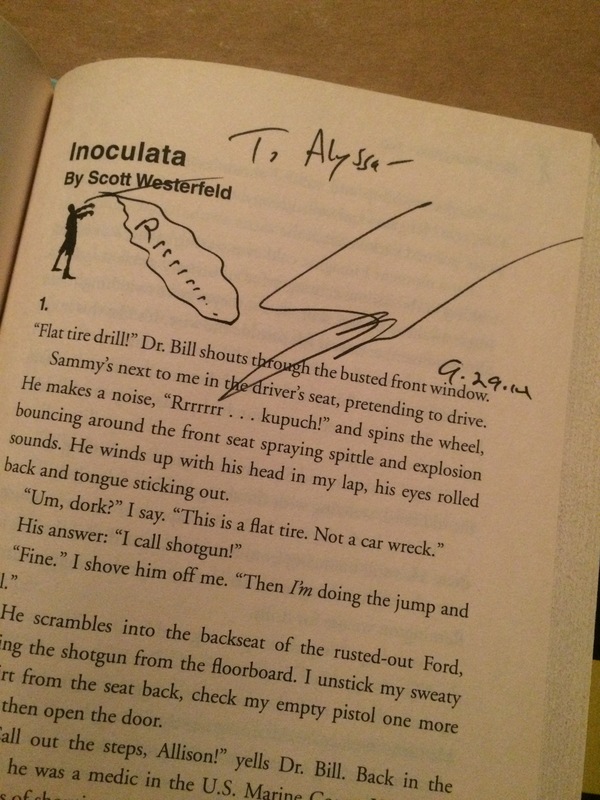 I’ve dreamed of meeting Scott Westerfeld since I was 14. His stories helped me through the toughest times of my life. Uglies is the reason I love reading, the reason I’m going to school to be a Librarian, and the reason I am a writer. 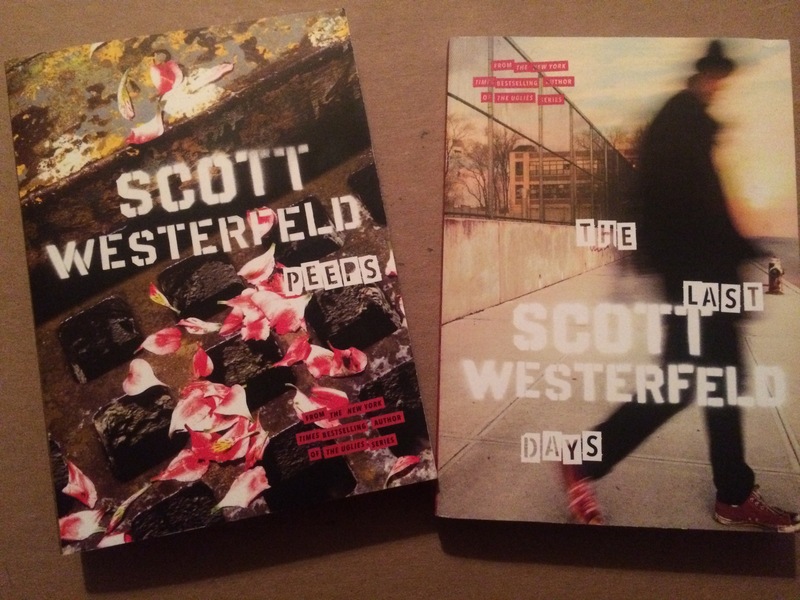 Have you guys read anything by Scott Westerfeld? 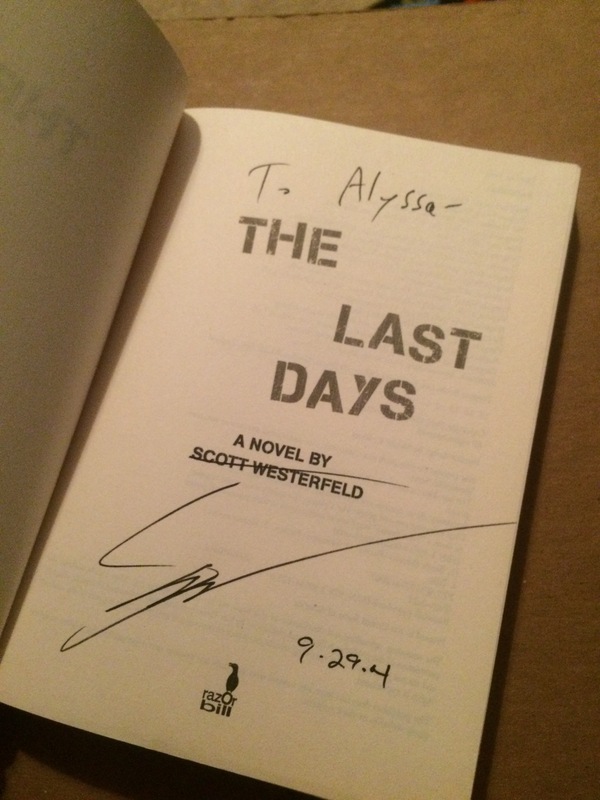 So I just got home from yet another author event in STL! 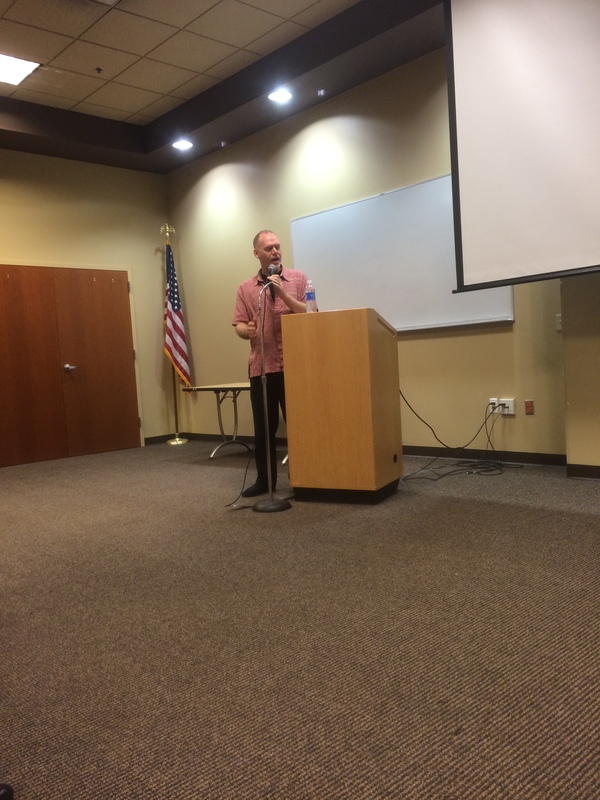 I am loving all the YA events that have been happening lately here in the midwest! This is like the anti YA book event zone I swear! I look at the coastal cities and they get SOOOOO many author events! Here are the authors I got to be in their presence tonight! In case you didn’t count, that’s ELEVEN authors! It was fantastic! I went mainly for Lindsay since I read TMC recently and fell in love with it! And I’ll be posting a review next! I so wished I had enough money to buy each of these amazing authors books! I felt inspired by their stories and they were so fun and down to earth!!! 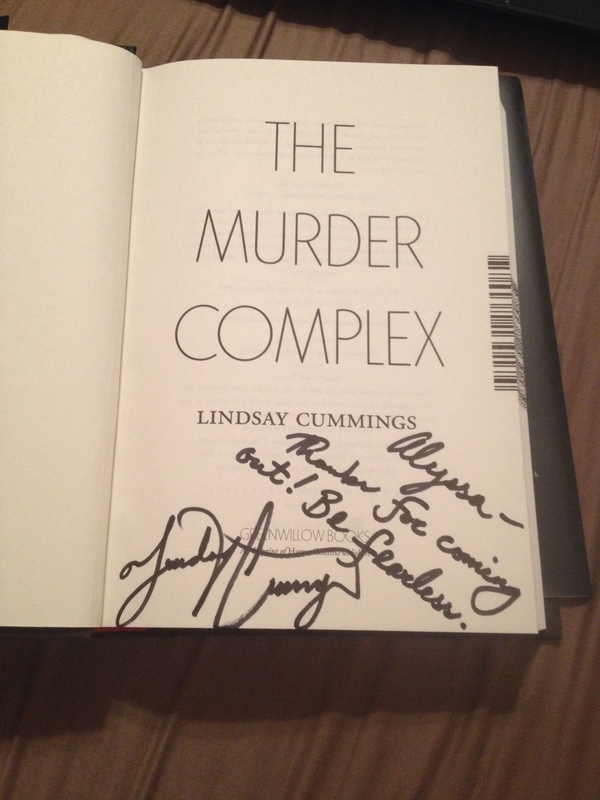 I only had Lindsay and Bethany’s books to be signed! 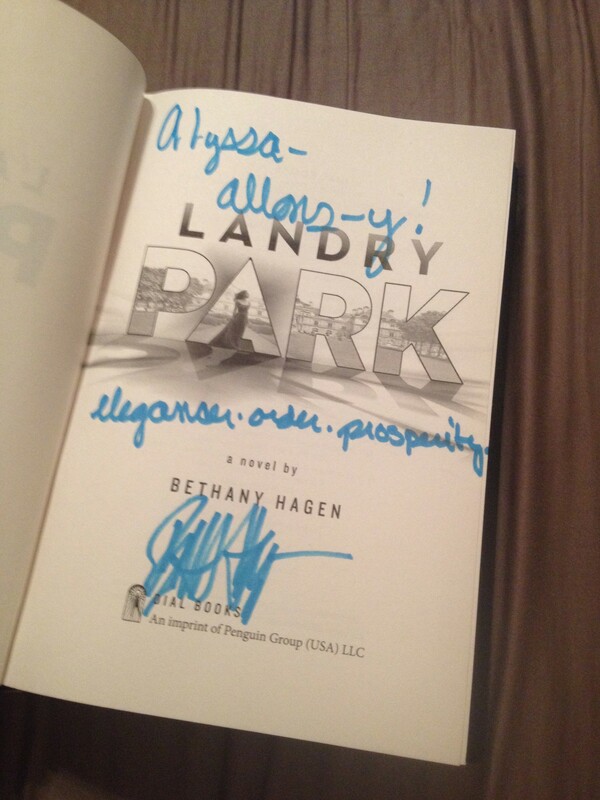 I about died over what Bethany wrote in my book! ALLONS-Y! Any other Whovian’s out there?! I also about died when I walked up to Lindsay and she was like “We talk online don’t we? !” it was like talking to one of my good friends! She was also super sweet and asked about my engagement ring! 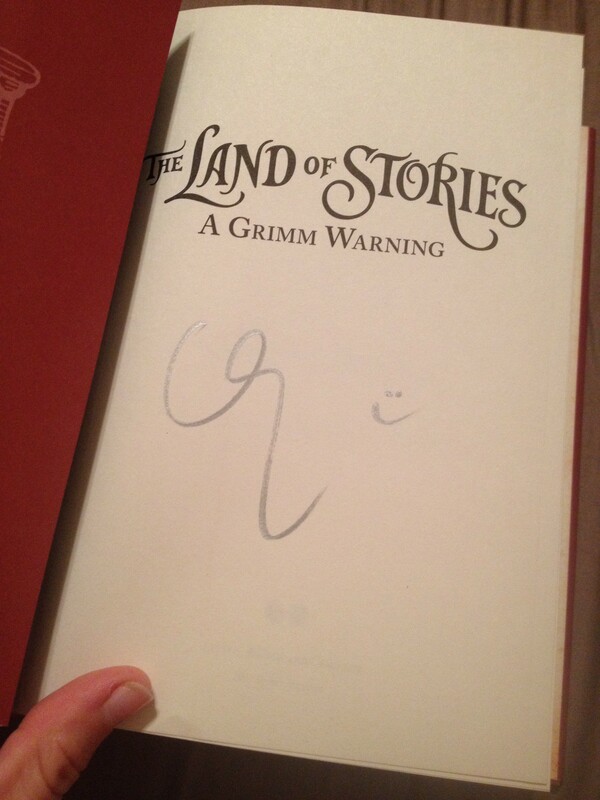 Also since I am posting my signed books, I went to the Chris Colfer signing on Tuesday. There was over 800 people present!!! All I kept thinking was what a hand cramp he is going to have after today! Haha! 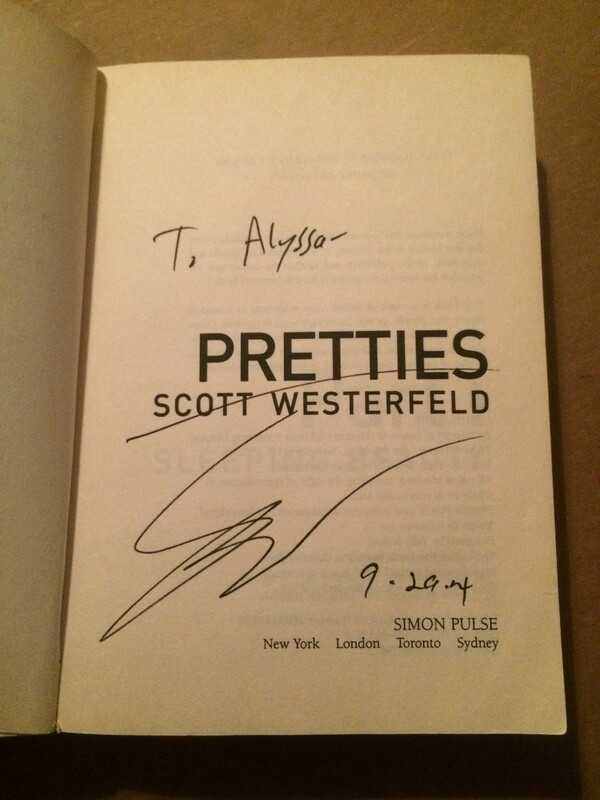 Anyway He answered some questions and then signed everyone’s books! He was so sweet and pretty much the most perfect looking person I have ever met… Like there’s totally a reason they call him Porcelain on Glee. All the authors were so amazing and I hope you all check them out and maybe read some of their books!!! So I’m definitely slacking on posting on here! Which is a combination of laziness and being half dead with whatever sickness I decided to procure. Any who I am currently reading The Blood of Eden series by Julie Kagawa. Which I’m not all about books with vampires as I’ve mentioned before. However I LOVE Julie Kagawa! So I gave it a shot for her, and I’m glad I did!!!! I’m on the last book right now so as soon as I’m done I’ll be putting up my review! I got the first book for free on iBooks because it was the featured book of the week a few weeks ago! Next on my list is City of Heavenly Fire by Cassandra Clare. I kinda want to re read the series so I can re-absorb the greatness of the series! ALSO TFiOS comes out this week!!! I just bought my ticket and now all I need to buy is a box of tissues to go with it. They should really consider selling a ticket-tissue bundle for this movie. I’ll post about the movie as well! I’ve been writing quite a bit lately so I might come up with a little description of my book so I can see if it actually sounds like something some of you would read. I just want to share this because I’m SUPER excited! In a few weeks I’m getting engagement pictures done. I decided to do a fun/nerdy location, The St. Louis Public Library and here is why! How beautiful is that building! I have the pleasure of living 30 minutes from downtown STL. I’ll post some of the pictures once I get them! I feel honored!!! Liebster Award! So I was nominated by a good friend of mine and fellow blogger Wayward Knight! So honored by this! I really would love for this blog to do well. It’s been so nice being able to share my thoughts and nerdiness on here with people! I’m excited I can nominate people too!!! So here is what this is all about! Matt, Thanks a thousand times for the nomination! Choose eleven questions to ask your nominees. 1. I am obsessed with the color pink. Honest to goodness my Fiance and I sleep in a pink bed… and I wear it just about every day. 2. I LOVE HOCKEY! I played for about 8 years and then worked for my High School Hockey Team! Lets Go Maroons! I also love the STL BLUES! 3. I fell in love with my kinda high school sweetheart! We started dating in 2009 and he proposed to me last summer in Florida. 4. I love table top gaming!!! My best guy friend Matt (aka Wayward Knight) was my first DM and had me hooked 10 minutes in!!! 6. This is the first time I’ve really told people, I’m writing a book! And it’s terrifying to say that! 7. I have a cat-child thing. Her name is Pixie and I can’t tell if she really loves me or is plotting my epic demise. 8. Belleville Township High School Library is where I fell in love with reading! Thanks to my freshmen English teacher Ms. D! She recommend me a book that opened up a whole new world to me that I never knew could exist. 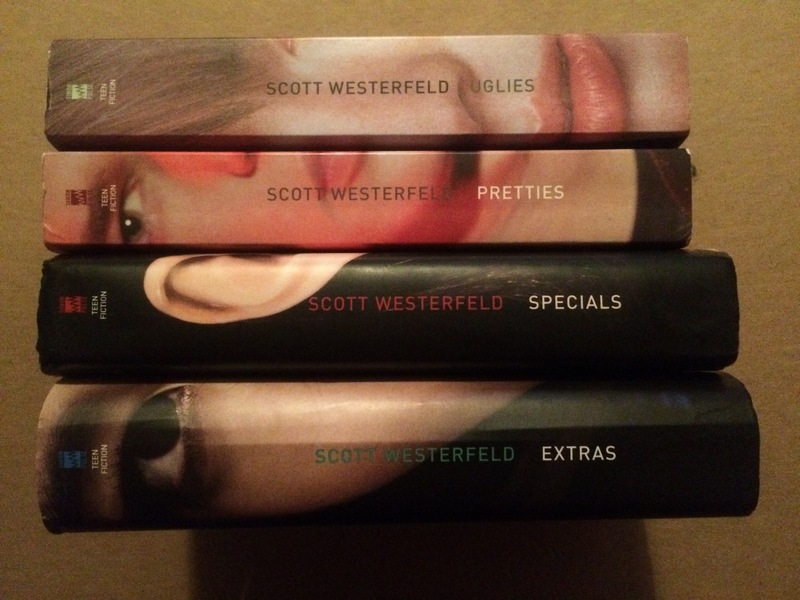 Uglies by Scott Westerfeld is still my favorite book. 11. I am a Christian. I believe in God and I’m proud of that! 1. What drives you? What makes you feel a sense of purpose? The need to better myself and enrich myself with knowledge. I a sense of purpose when I can help someone in any way or form. 2. You have been given one wish with several rules: you cannot wish for more wishes, you cannot wish for immortality, and you cannot wish for endless wealth. What would you wish for? I wish that people could live day free of every sort of pain. Emotional or physical. 3. If you could master any skill in life, what would it be? Writing. I would love to be a writer. 4. If you could live in any time period other than the modern era (1960-Present), when would it be? 5. How do you define love? This is a complicated question. You can define it so many ways. I would say I define love as an emotion that I feel when I’m closely bonded with someone/something. I would do anything for the people I love and would defend them with my life. 6. You’re going to die tomorrow. What would your last meal be? Fried chicken and mashed potatoes with gravy with my Granny’s yeast rolls. 7. If given the opportunity to change something about yourself, what would it be and why? I would be more creative. I always admire people with the things they come up with. I would love to have the creativity of some of the authors I love. 8. Do you have a favorite movie? If so, what is it and why is it your favorite? Welp… I love me some Frozen and Little Mermaid. I love the innocence in these movies. It gives me hope that there is light beyond the tunnel no matter my situation. 9. Let’s also cover a favorite band or genre of music. What is it and why does it strike a note with you (pun intended)? This is tough. I love all music. I really enjoy Metal though… Avenged Sevenfold is one of the most amazing bands! I love the composition of their music, it’s almost classical when you really listen. 10. How would you react if your favorite artist, singer, actor, individual from history, etc. walked up to you and struck up a conversation? What would you say to them? Well me being me, I might cry. When I’m too happy or too sad I cry pretty easily. 11. If you could live in any universe (Lord of the Rings, Harry Potter, Mass Effect, etc.) what would it be? 1. 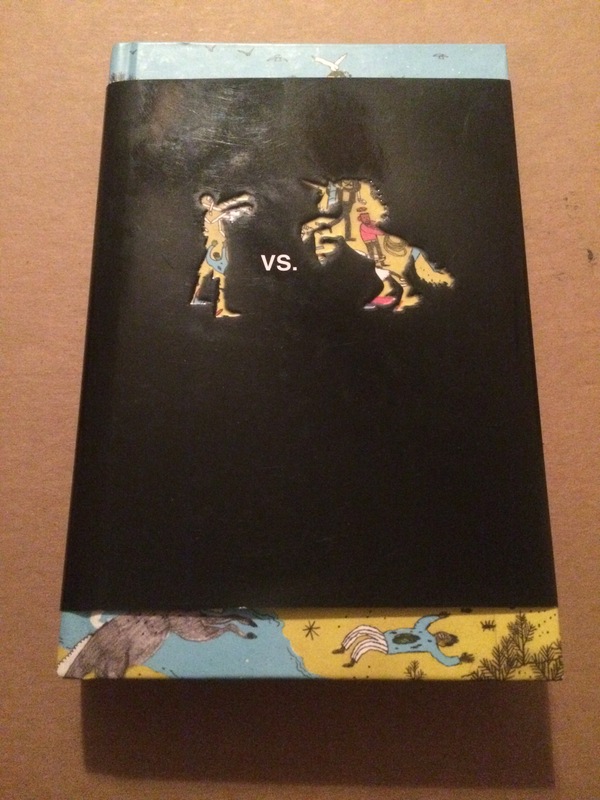 Being that all of you post about books, what is your favorite book and why? 2. How did you get into reading? 3. You’re stranded on an island, all your basic needs will be met (Food, water, shelter, etc) What three items do you bring with you? 4. What is your favorite place in the entire world and why? 5. I’m stealing this question from Wayward Night, How do you define love? 6. You won the lottery!!! What are you going to do with your winnings? 7. How do you describe yourself? 8. If you had one superpower, what would it be and why? 10. When you read, what type of environment do you like to be in? 11. What is your all time favorite memory or thing you’ve ever done?